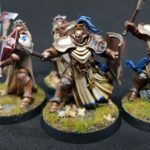 Painting guide – Stormcast Sequitors. 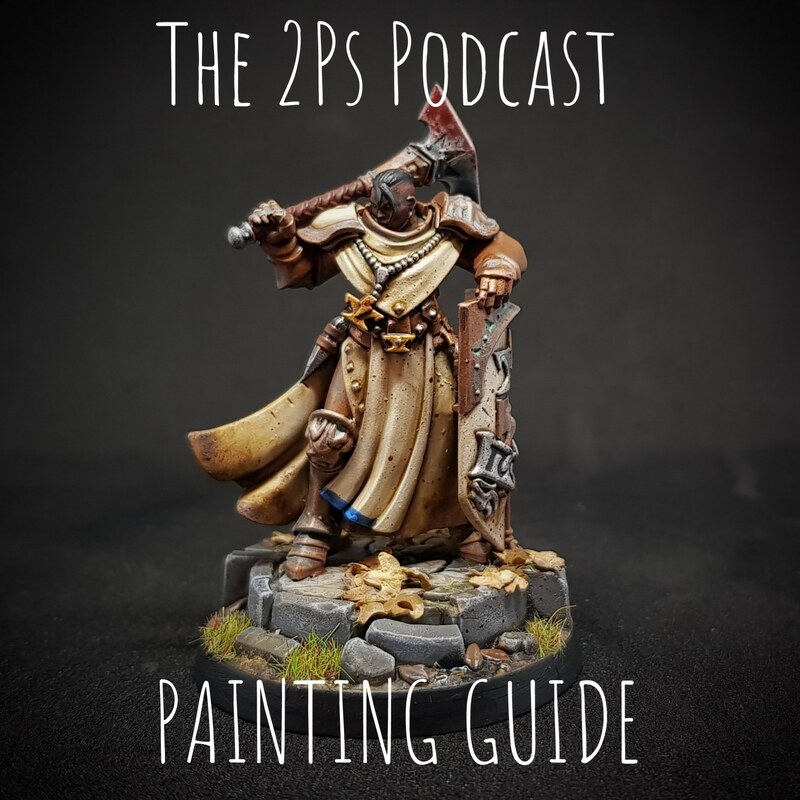 Welcome to our second painting guide. 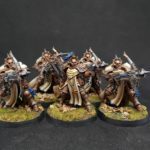 While I will be taking you through how I painted my Sequitors, I used the same process to paint the Castigators, Evocators and the characters from the soul wars box. The models were cleaned up and assembled, then washed and scrubbed with a toothbrush to make sure there was no dust. 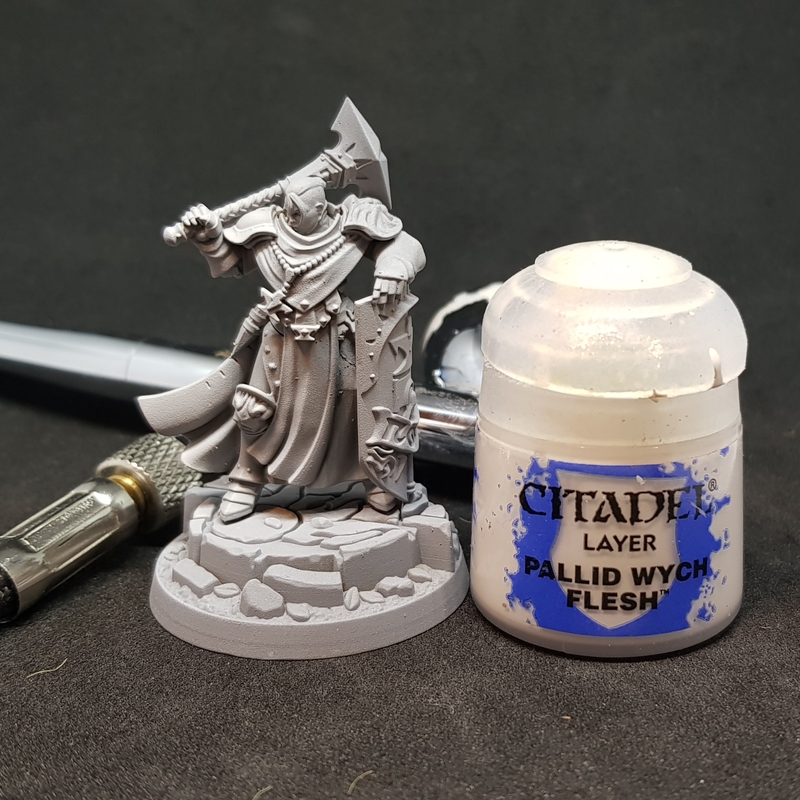 The primer I used was Halfords grey. 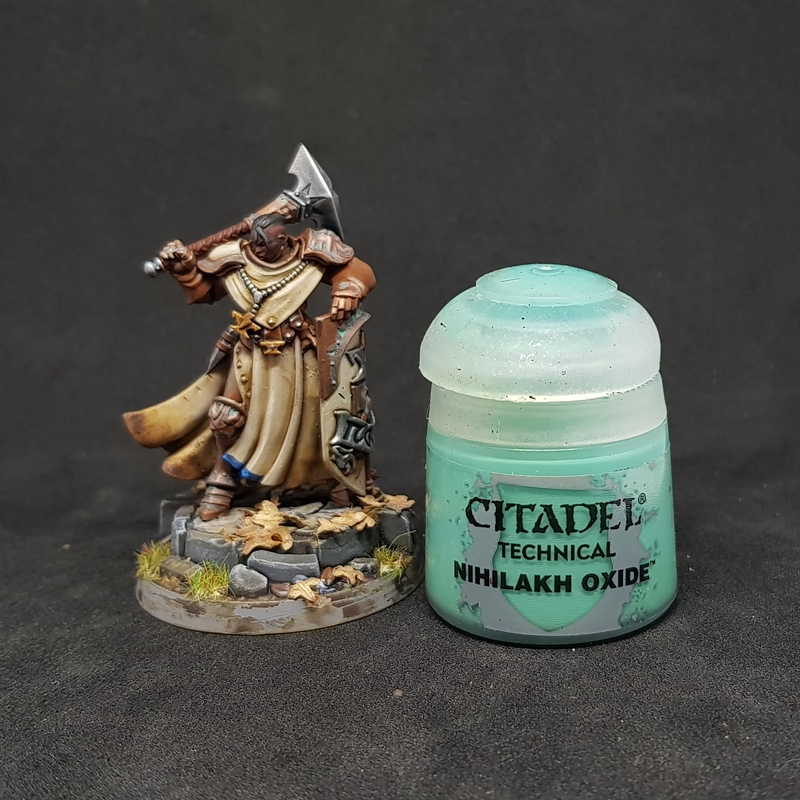 My absolute favourite primer. 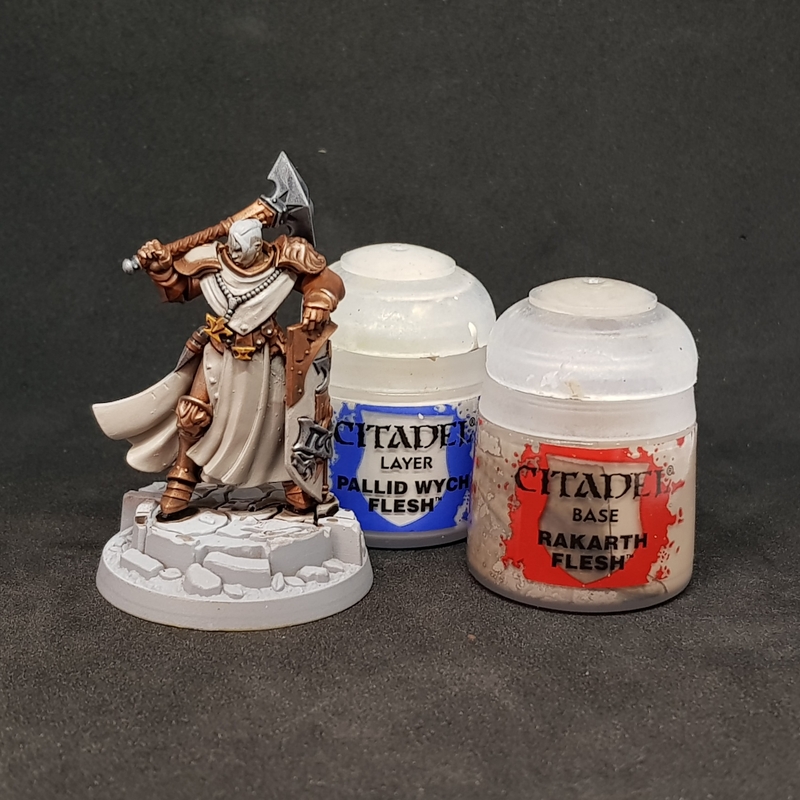 Because the primary colour on these new stormcast is the cloak, I thought I would basecoat them with Rakarth Flesh through the airbrush and then a 45 degree zenith with Pallid wych flesh. However as you can see later on I had to block out the cloaks again, so this was a rather wasted step. 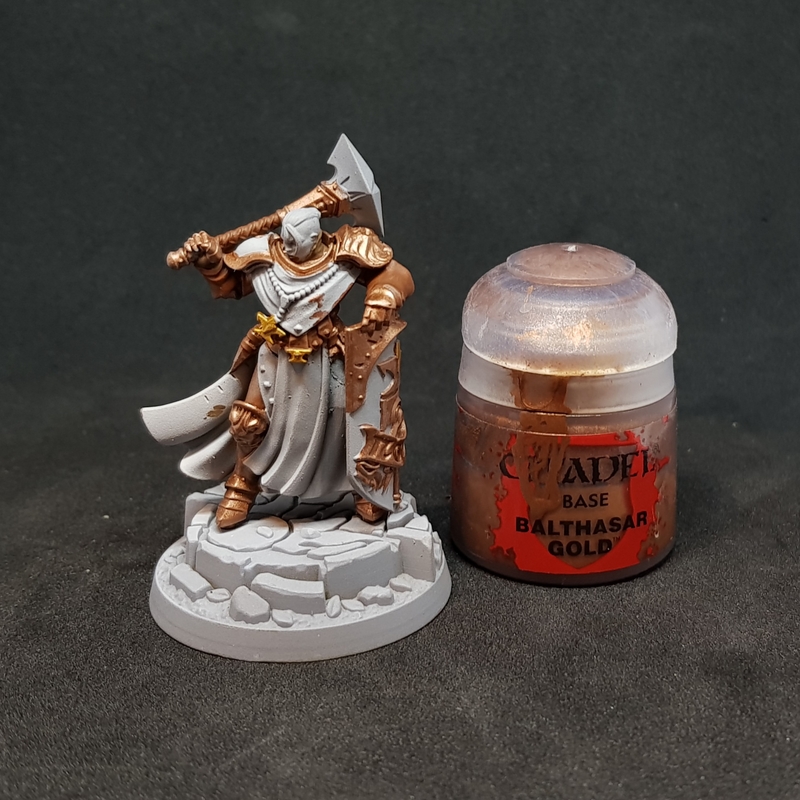 In retrospect I would suggest starting with a flat basecoat of Balthasar Gold, as I normally would for my Stormcast. By “zenith” I aim the the airbrush down from the top. This can quite literally be directly from above, or as I have in this case from 45 degrees. I think going further than 45 would eliminate the effect. 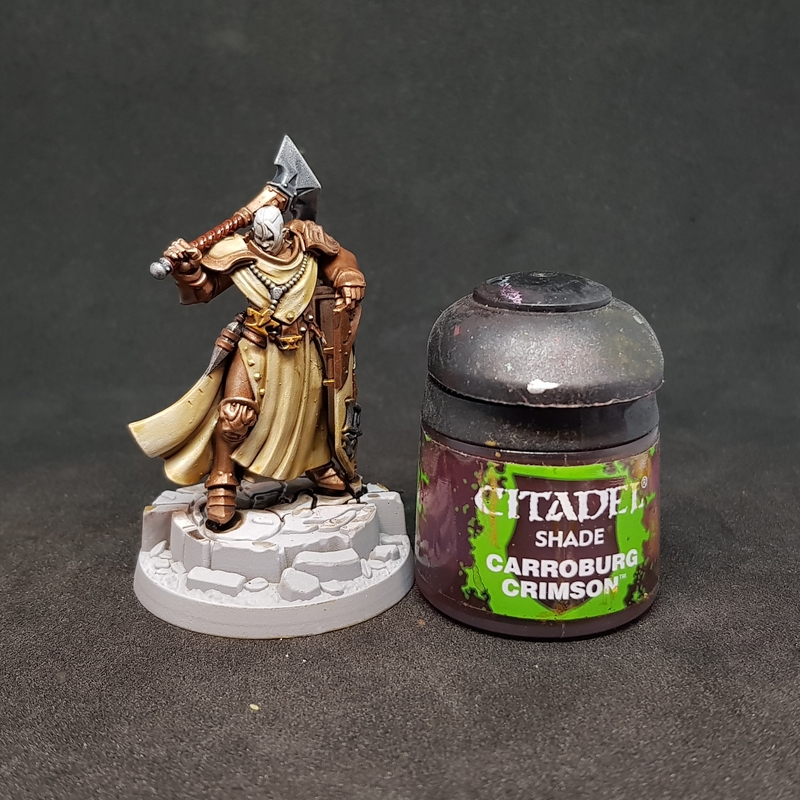 The next step was to block out the armour. 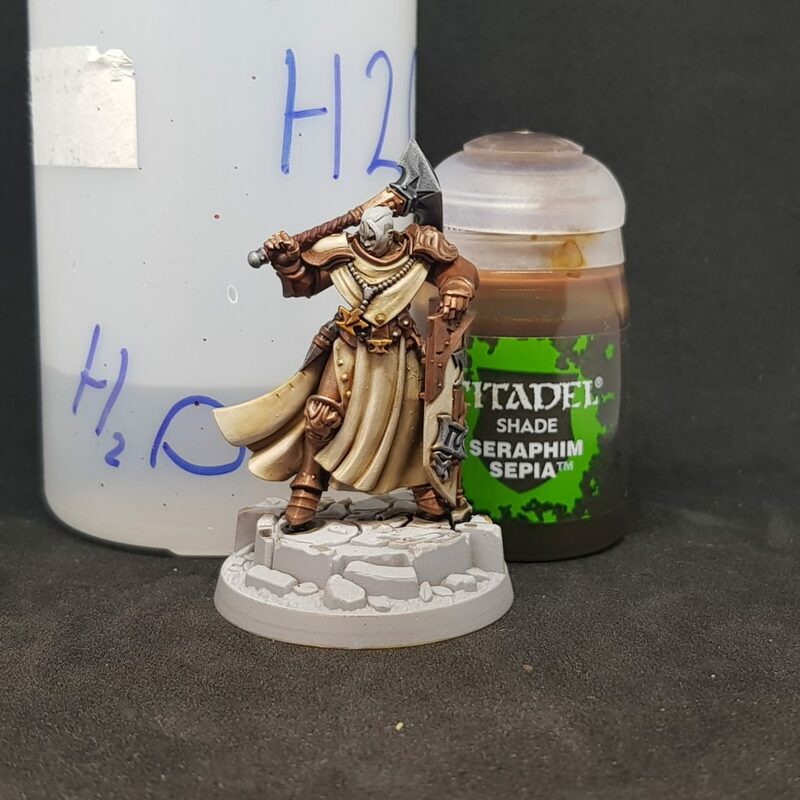 I was aiming for a bronze colour and I have found that I really like the look that Balthasar gold gives for this. 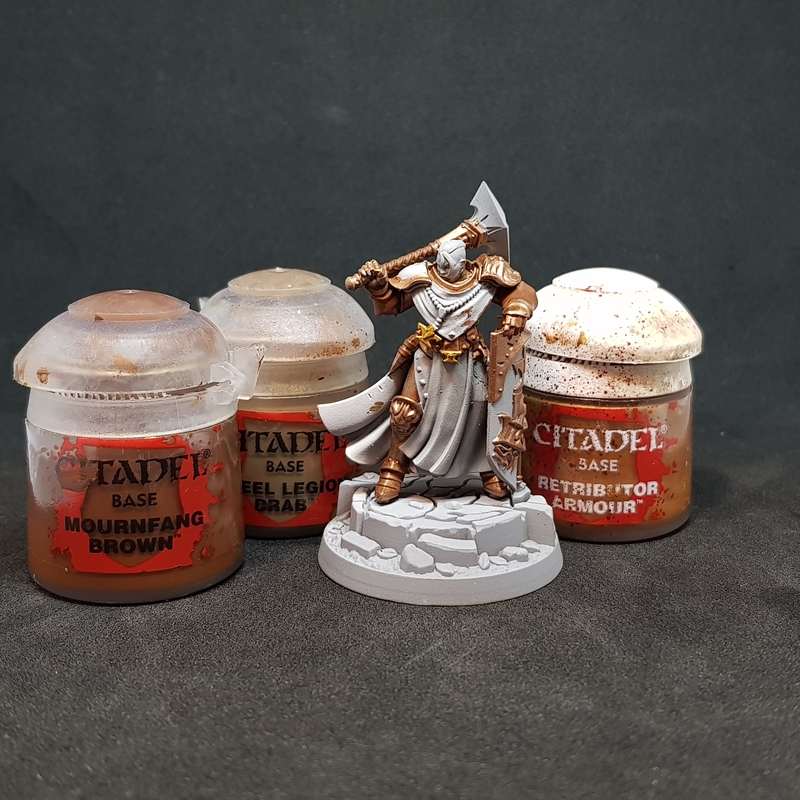 Because the armour is “deeper” than the cloaks, It took an awfully long time to get the armour basecoated. 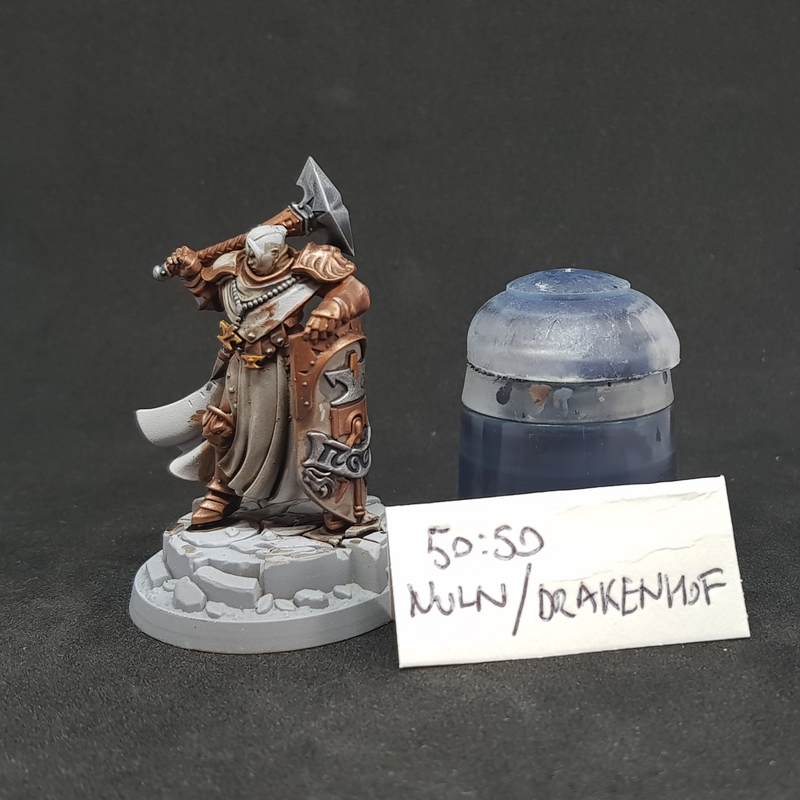 Also the further I went through the batch the less careful I was, and so inevitably some got on the cloak basecoat. 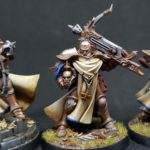 As I said above, if I did these again I would start with a basecoat of Balthasar, probably through the airbrush. 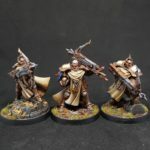 Once I had done that I picked out the undercloth in Steel legion drab, the leather in Mournfang brown. 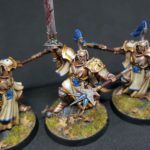 I noticed on these that their bracers are leather, not armoured like on Liberators. 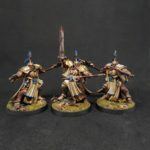 The gold items on the primes and Evocators were picked out in retributor armour. 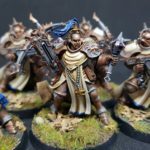 I added a fair bit of gold to the Evocators to mark them out as an elite unit. 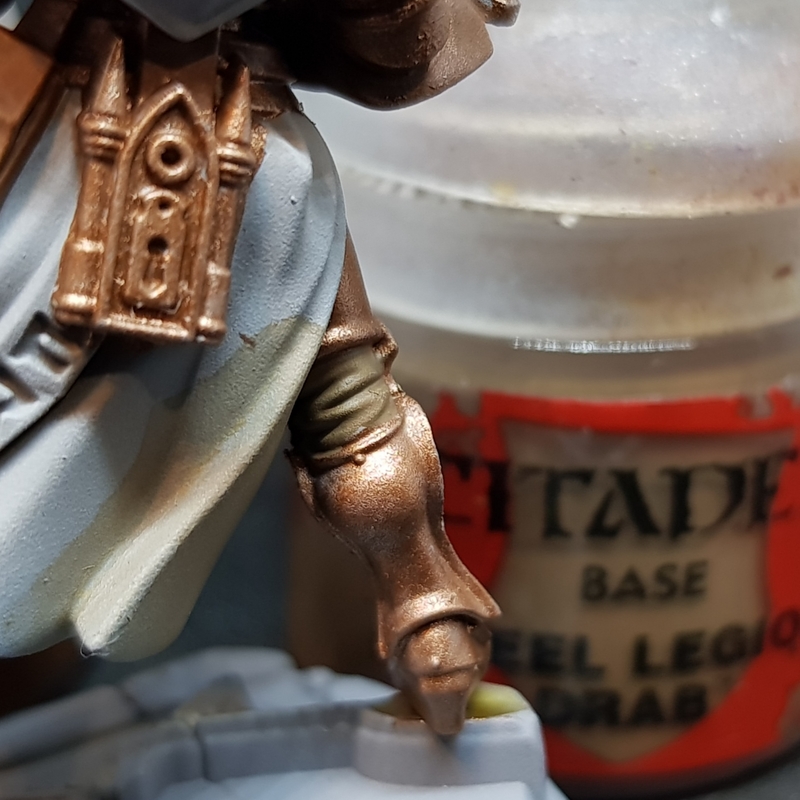 Below you can see the leather straps in the fossa of the elbow the undercloth below that painted in steel legion (and the palm of the glove) and the bracers painted in mournfang. Don’t forget the undercloth in the knee fossa and the groin. 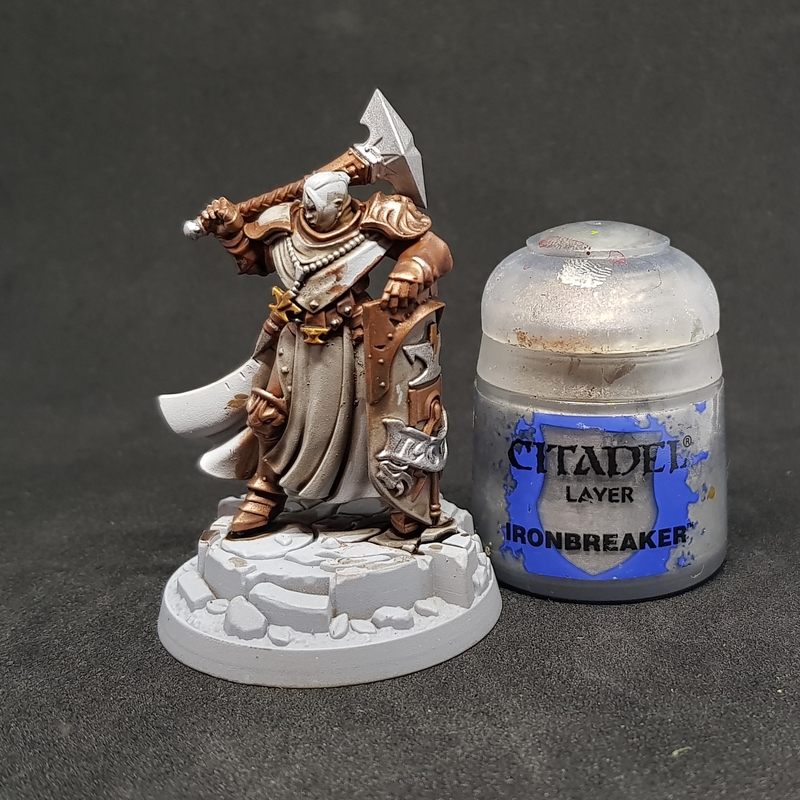 Next, all of the metalwork, the weapon, trims and pendants (don’t forget those buttons) got basecoated in Ironbreaker. 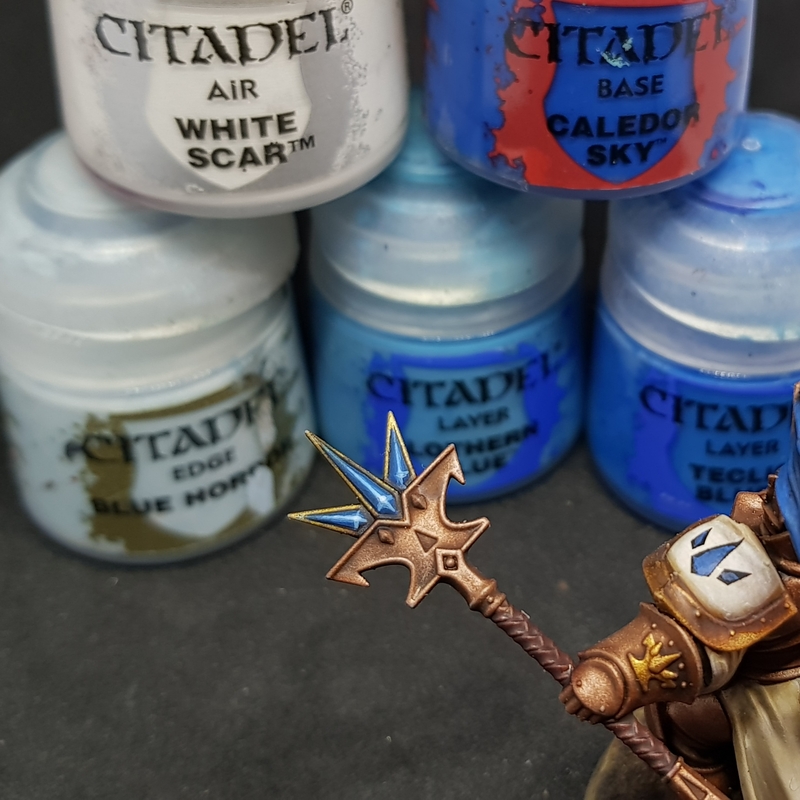 And then the sashes, plumes and anything else I wanted to pick out was basecoated in Caledor sky. 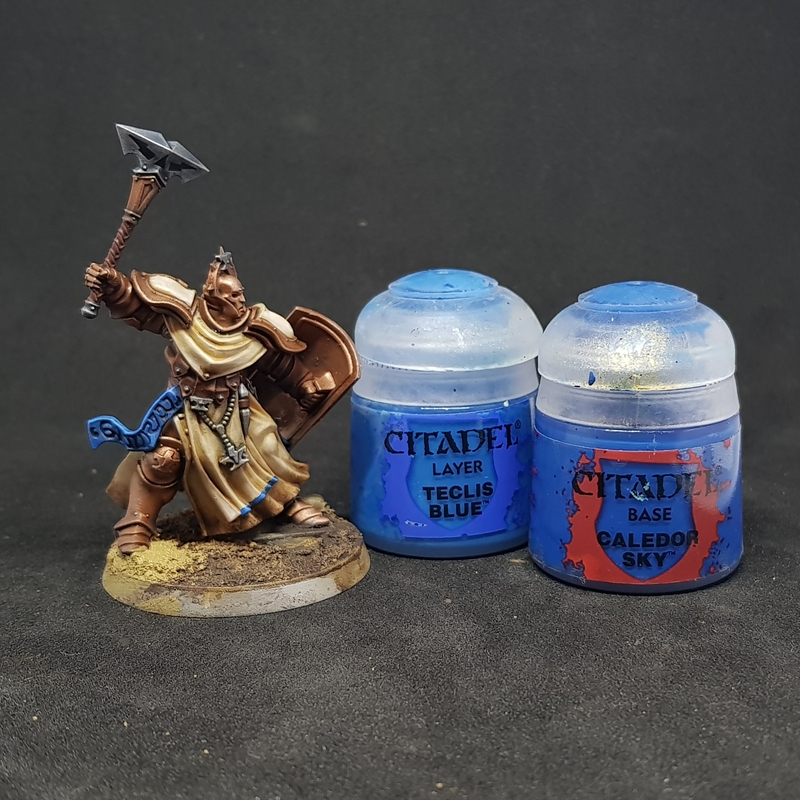 At this point, I realised that there were very few parchments on several of them and so I needed a further area of blue. 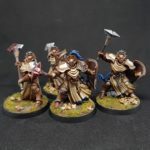 I decided that I would add a band of blue somewhere on their tabard later on. The next step is the cloaks, the shield and the pouldrons (shoulderpads). 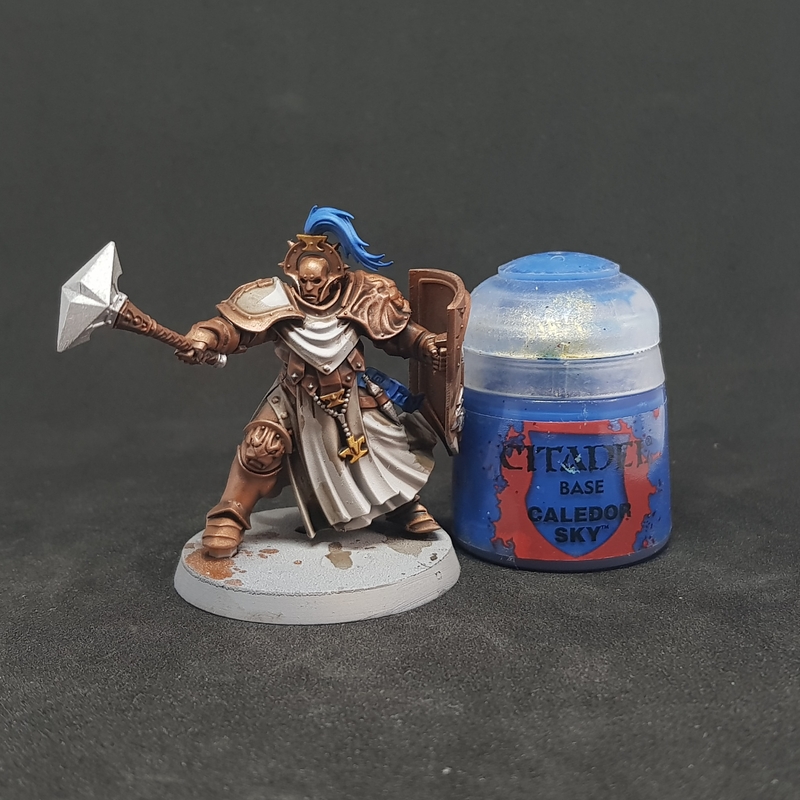 On my other Stormcast, the cream was done in a rather roundabout way to try and copy the colour I had achieved for Steelhearts champions. 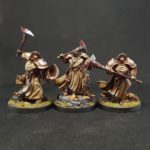 I wanted the same colour for the cloaks, but it does mean I ended up doing a rather lengthy process, that probably could be cut down an awful lot. However, this guide is about how I did it, so here we go. 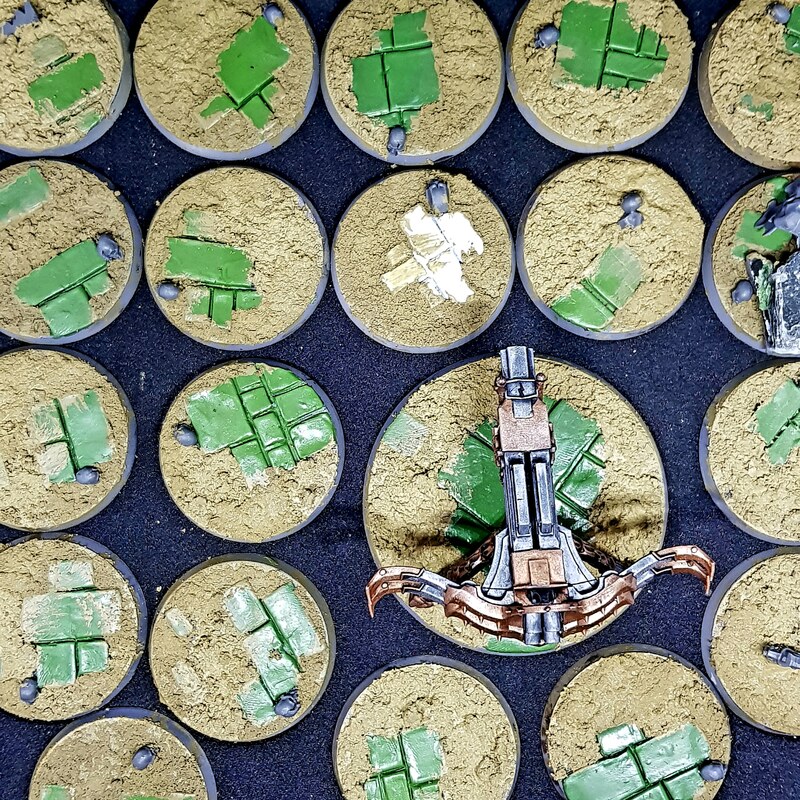 Note I left the models of their bases (or detachable) until the cloaks were done so I could more easily reach the undersides. 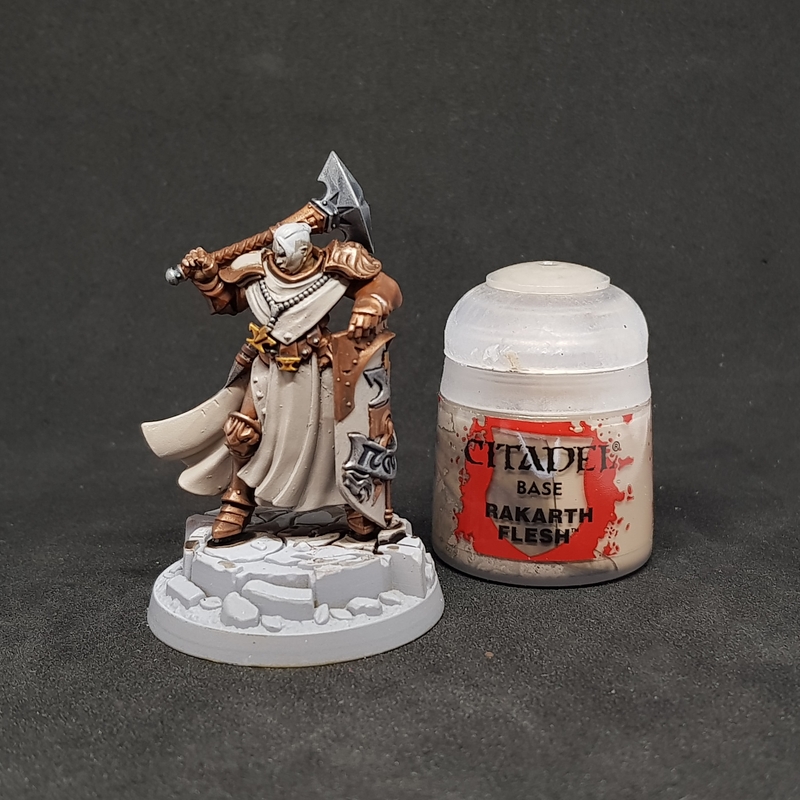 The first step was a basecoat of Rakarth flesh. 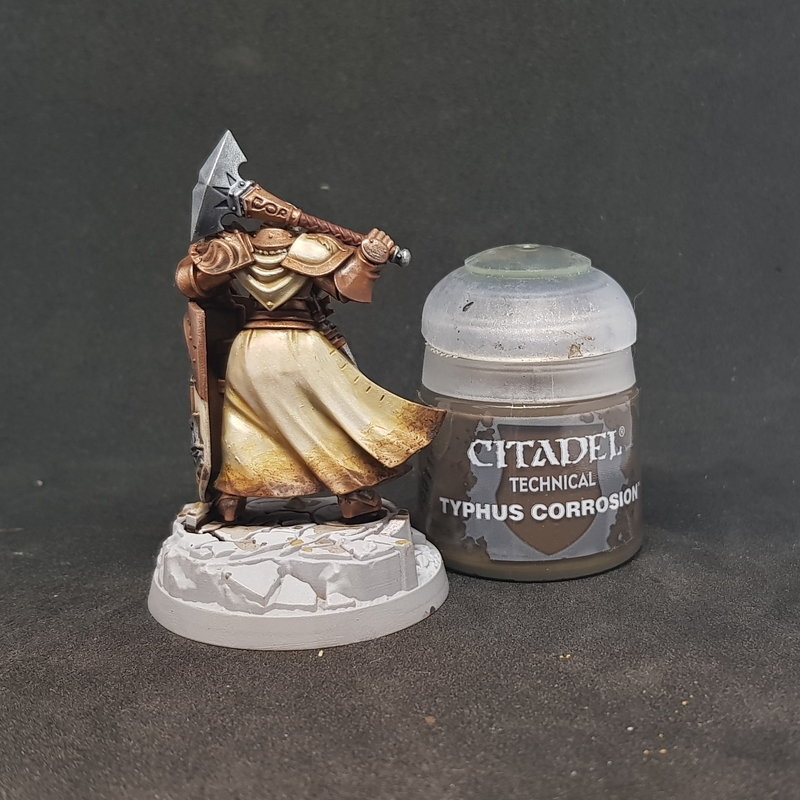 Next I did a very light wash of pure seraphim sepia, avoiding pooling except in the deepest cracks. On the pauldrons and the shield I let the wash cover the metal trim and the design in the centre of the right shoulder pad and shield (not the silver bit), this does not really affect the tone of the metal that much but does help to define the design on it and the edged of the centre area. I also washed the leather handle strapping in Carroburg crimson. 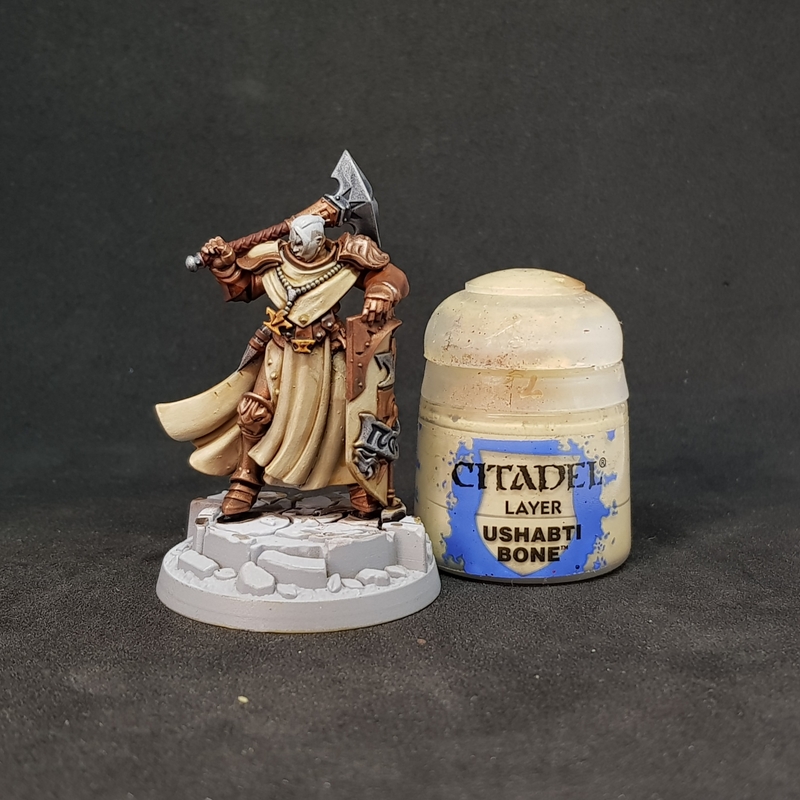 The bone areas were then highlighted once more this time with Ushabti…. Then screaming skull and fimally at the very edges pallid wych flesh. The last step was a heavily watered down Seraphim sepia glaze. I cant be sure but I think it was about 4 to 1 water to wash. This was applied only to the cloak. The shoulder pads and shield were left. The next step was to weather the cloak. 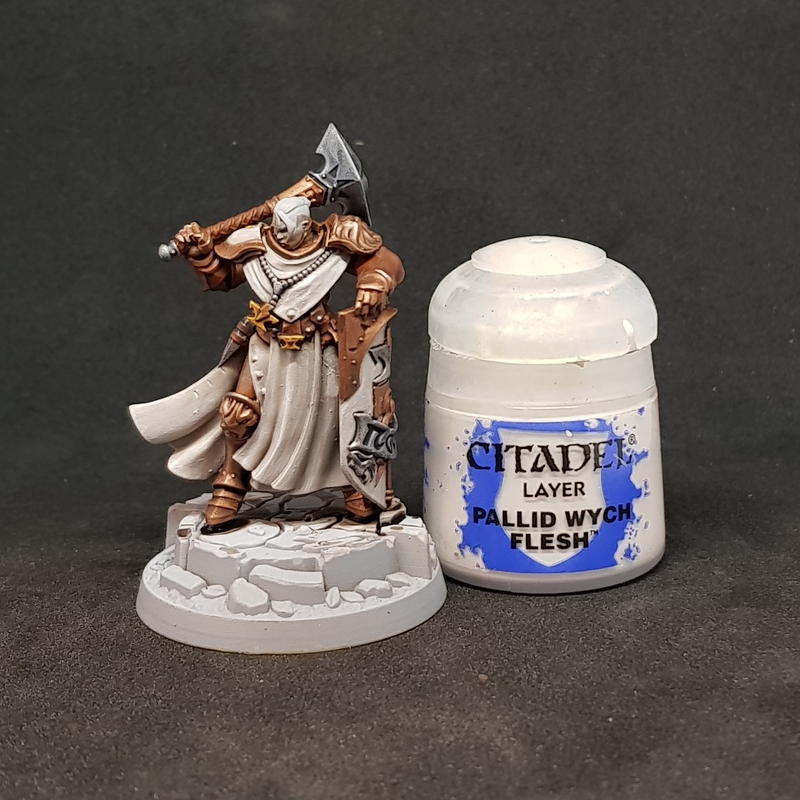 Using water as a suspension I applied a weathering powder to the bottom of the cloak. Once dry I applied thyphus corrosion to the bottom as well, leaving the previous stage showing. One this was done the cloak and the coloured panels were completed. 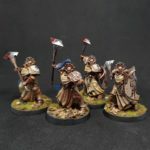 Now the cloaks are done I painted the bases. See later for how I did this. Note that at this point I added the blue trim on the tabard. I did this with caledor sky, then washed into the cracks with the mix I used on the rest of the blue (be careful! 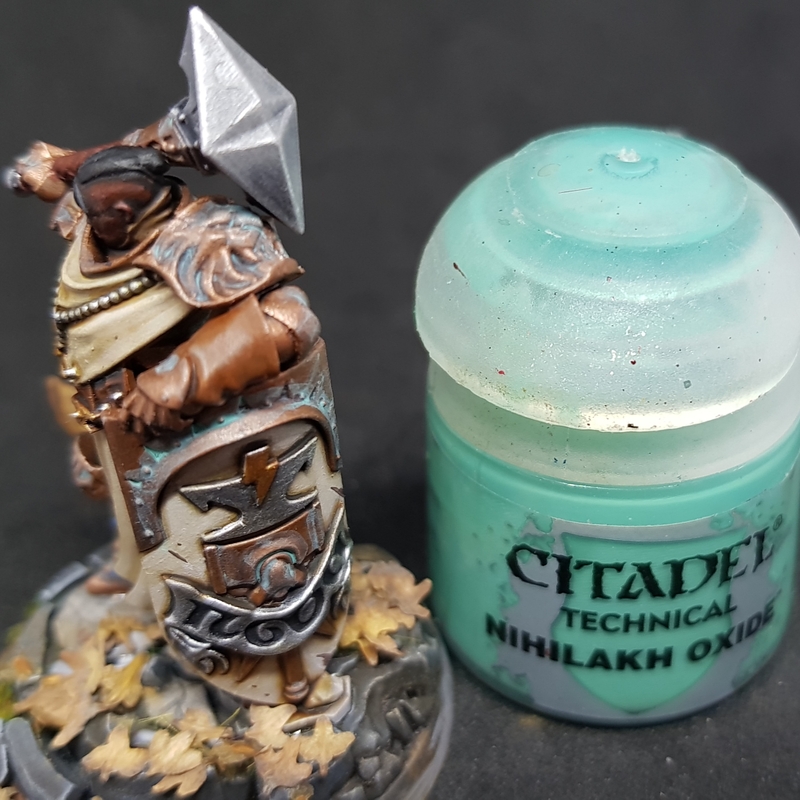 You dont want any on the cream cloak), and highlighted in the same way as the rest of the blue. 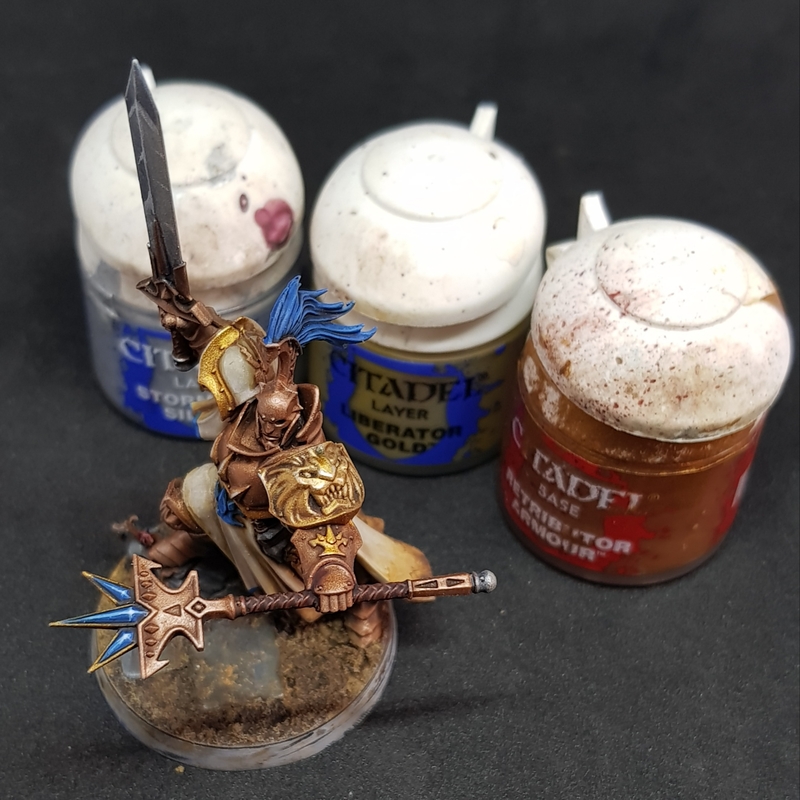 Now the gold was highlighted first in Retributor, then liberator and then a very small edge highlight of Stormhost. 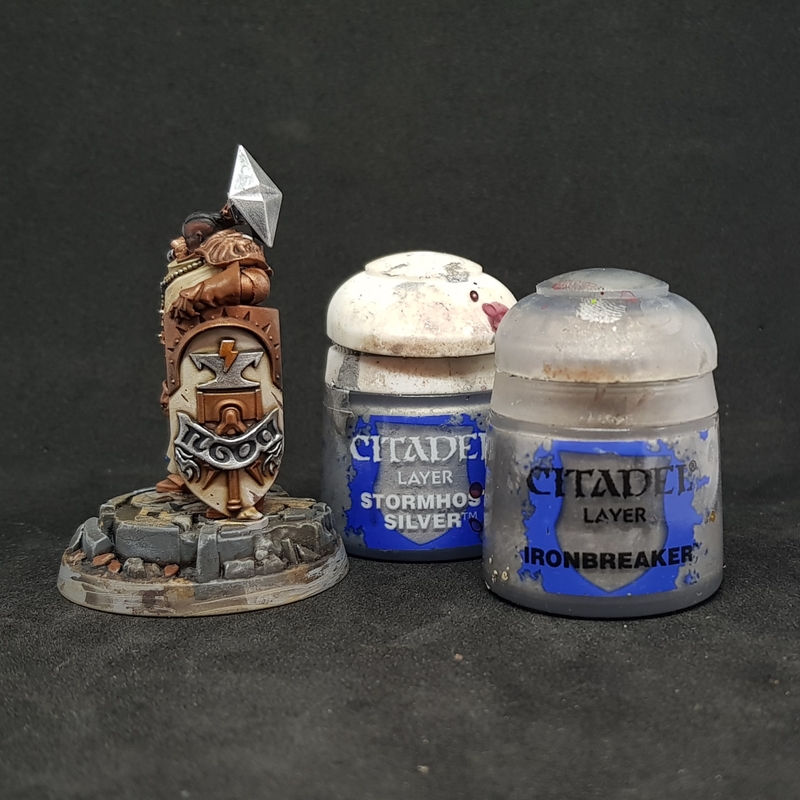 Now, the silver was highlighted with Ironbreaker first. 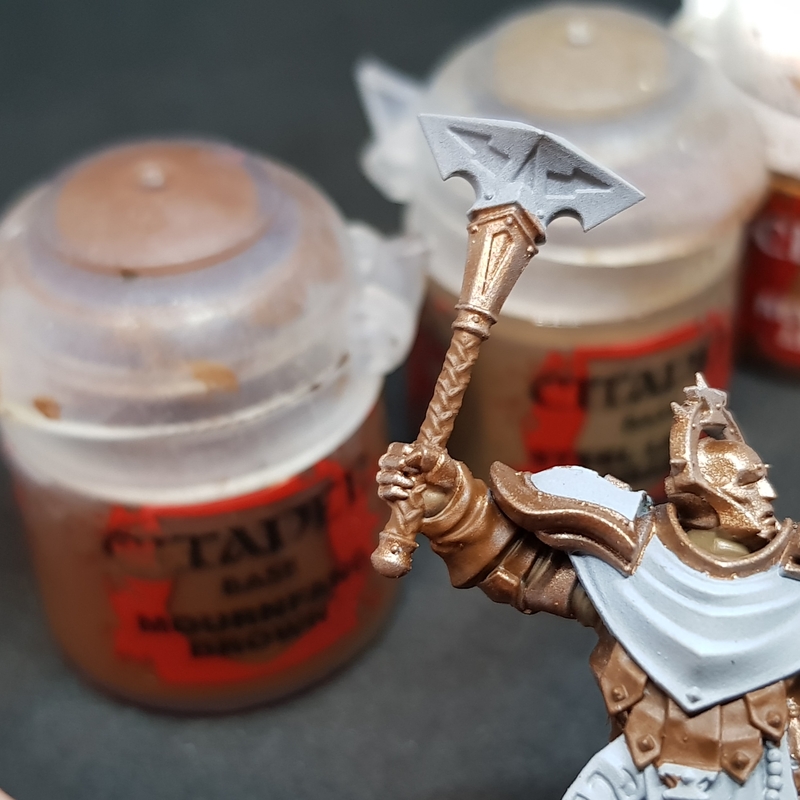 I actually drybrushed the maces, I found this gave a nice effect, and saved a lot of time. 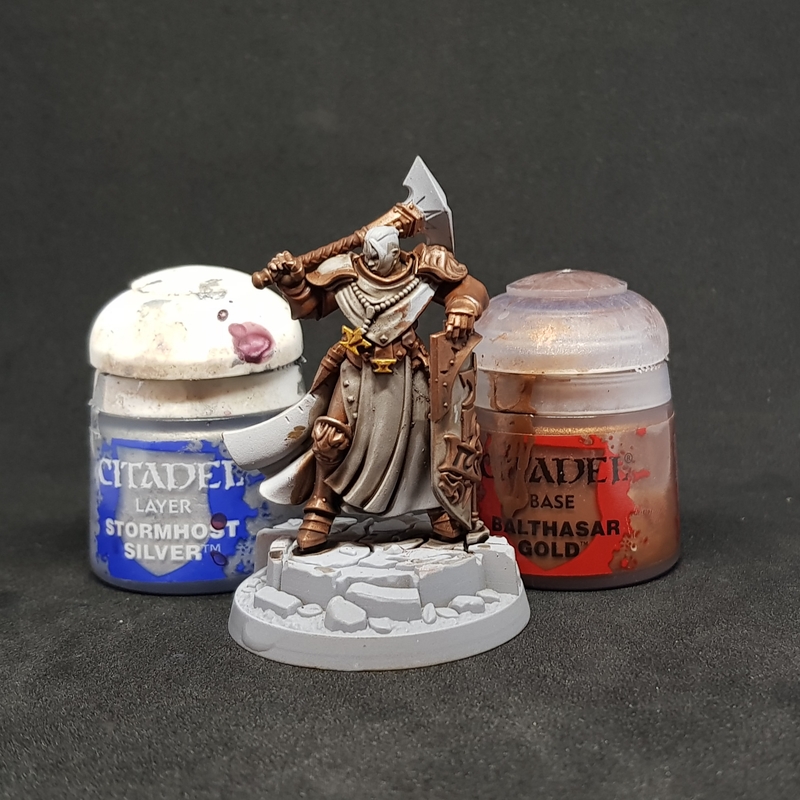 I then edge highlighted everything with Stormhost silver. The buttons were picked out with stormhost silver as well. 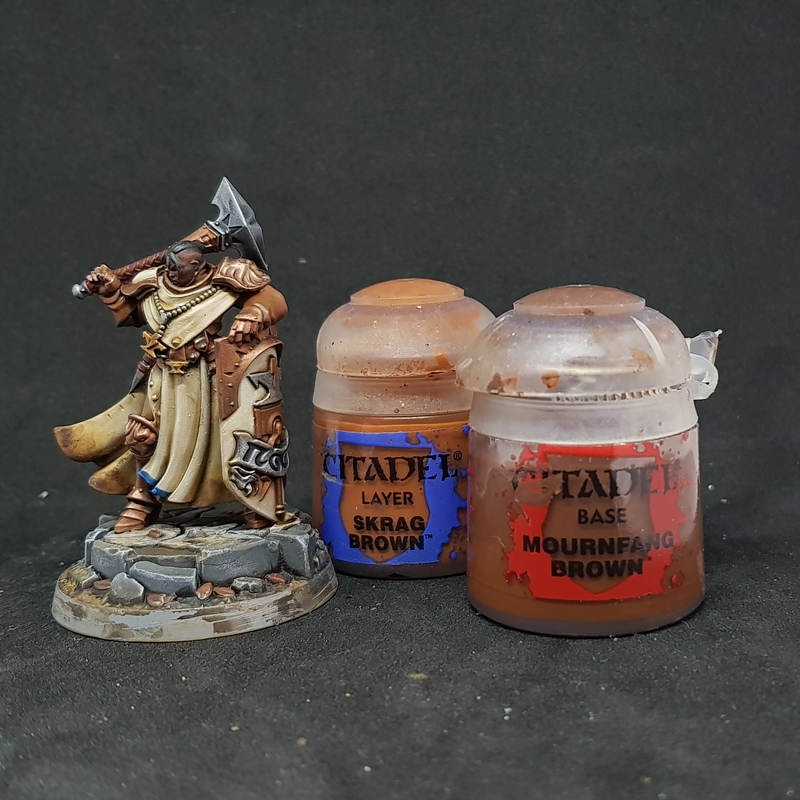 Now the bracers were highlighted first with Mournfang and then Skrag brown. I like the leather tassly bits on the front darker, so I only sparingly highlighted them with mournfang. The eagle-eyed will have noticed I had painted her face and hair during these stages. 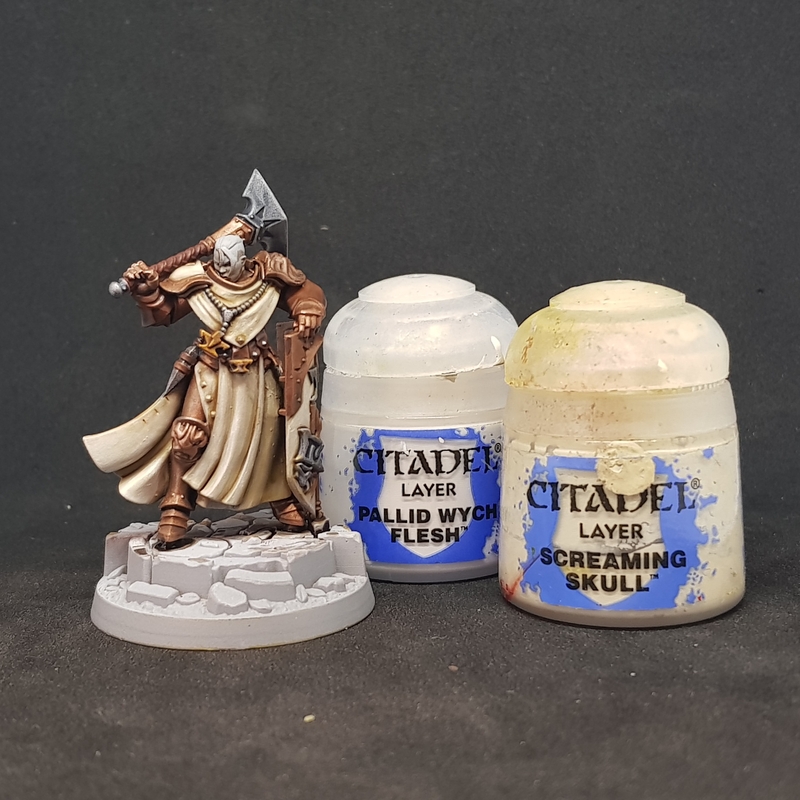 I have absolutely no set way of painting skin, I probably use about 10 different recipes. I do this on purpose to add variety and keep the natural aspect of the model varied. In short, paint the face however you want. 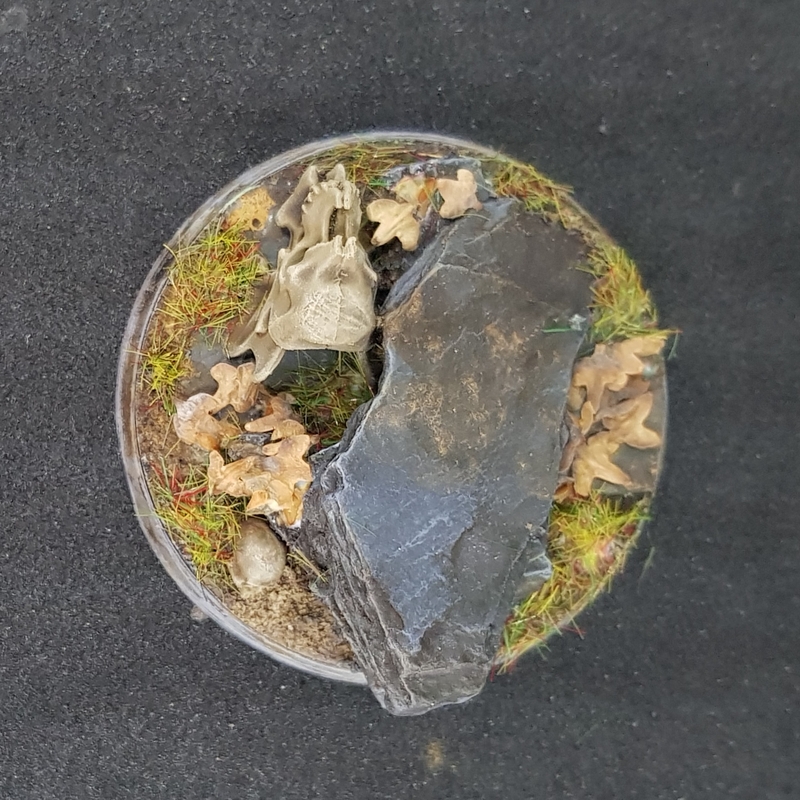 In this case I used Rhinox hide, highlighted with Doombull brown and then Bugmans. 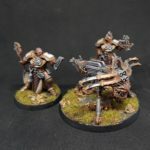 The bronze armour was spot washed with Nihilakh oxide, trying to blend in the edges of the wash. In the second picture you can see on the shield where I have not blended in the edge of the wash very well and there is a “tide mark”. I tidied this up later with some Balthasar gold. I added some chipping to the shield. Using Rhinox hide to create chips and scrapes and then Pallid Wych flesh to highlight the underside of the scratches. 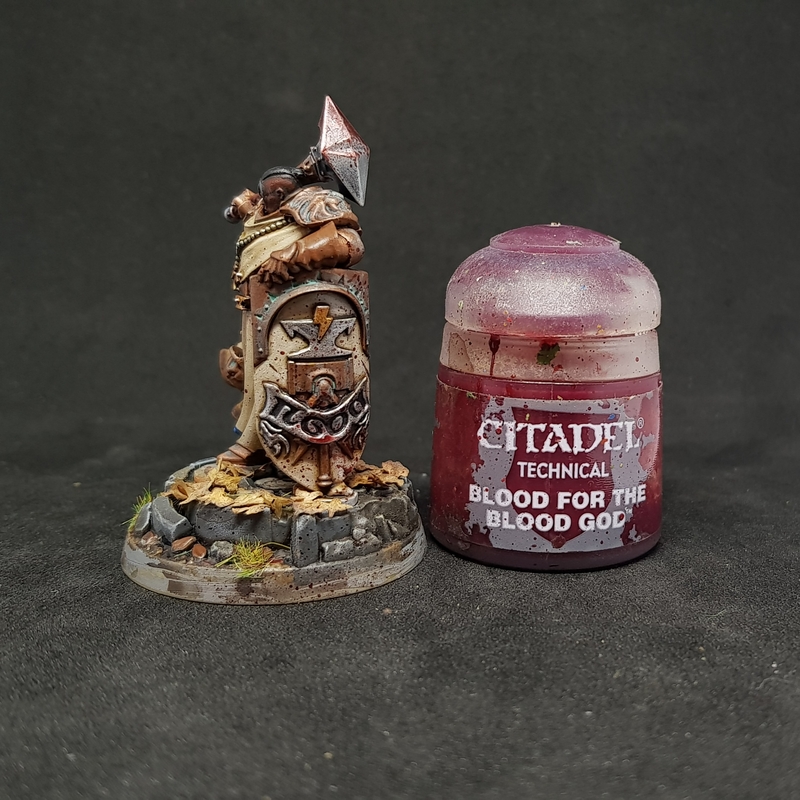 Next I added ‘blood for the blood god’. 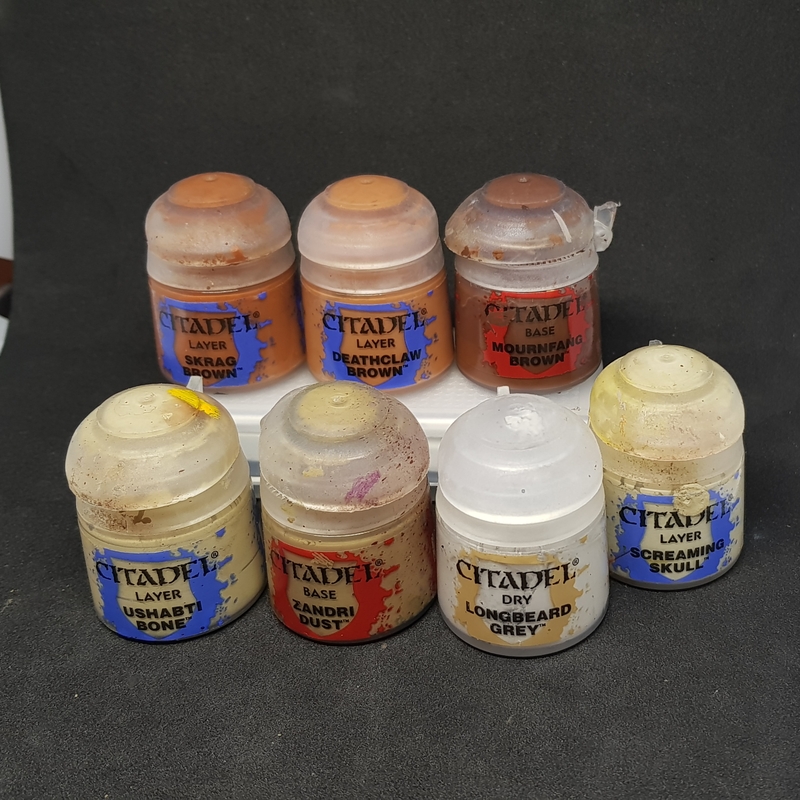 I did this using a sponge, brush and also loading a brush with a watered down mix of nuln oil and blood god and blowing air through it to create a splatter. 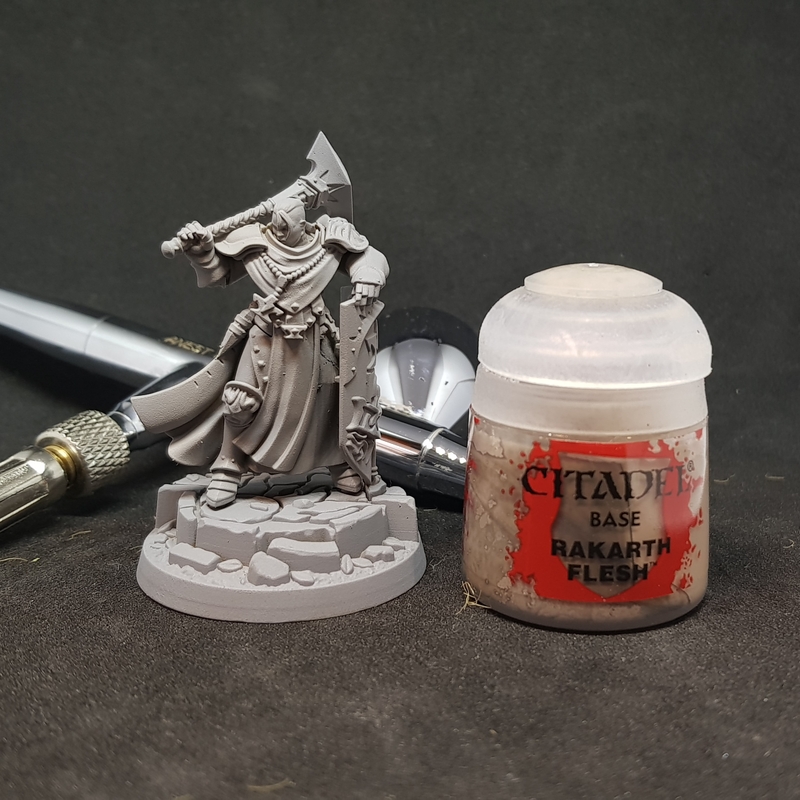 I used varied mixes of nuln oil into blood god to create a mix of effects. 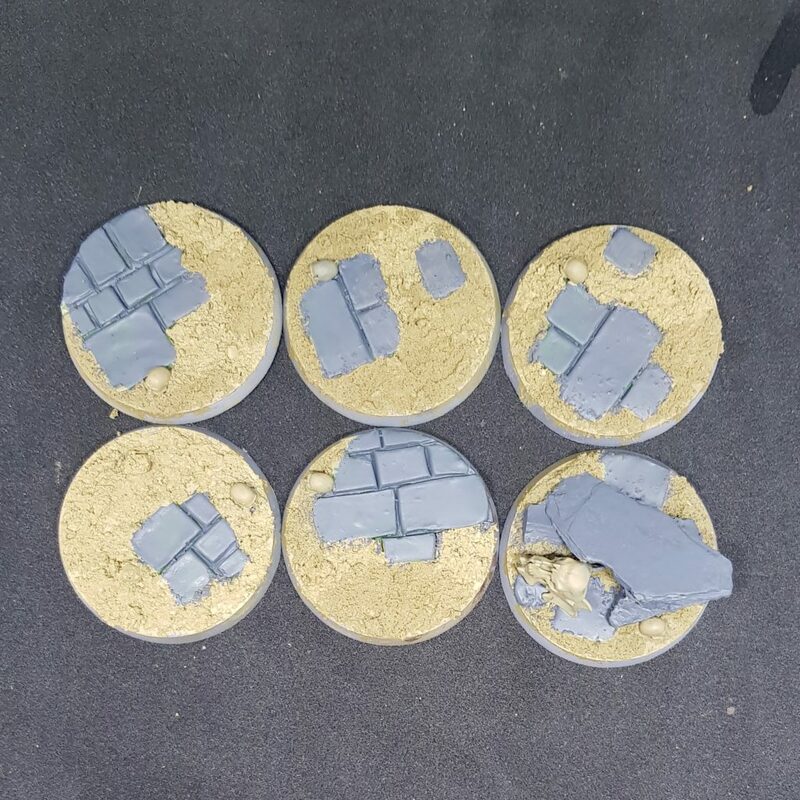 The bases that did not allready have sculpted detail were made by sculpting on the paving with greestuff and then adding some skulls and the dirt. The dirt was textured paint I made by adding various grades of grit too Zandri dust. I touched up using armageddon dunes, I didnt use this for the whole process dispite it being far easier to work with, due entirely to cost. 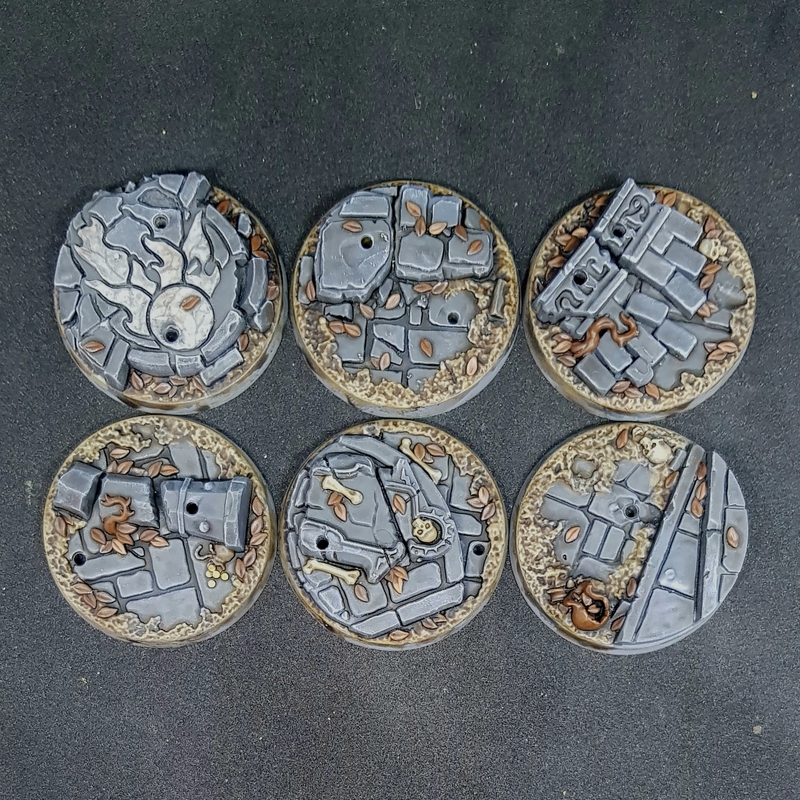 The paving was basecoated in mechanicum standard grey, the skulls and bones in Zandri, the roots and leaves in mournfang. 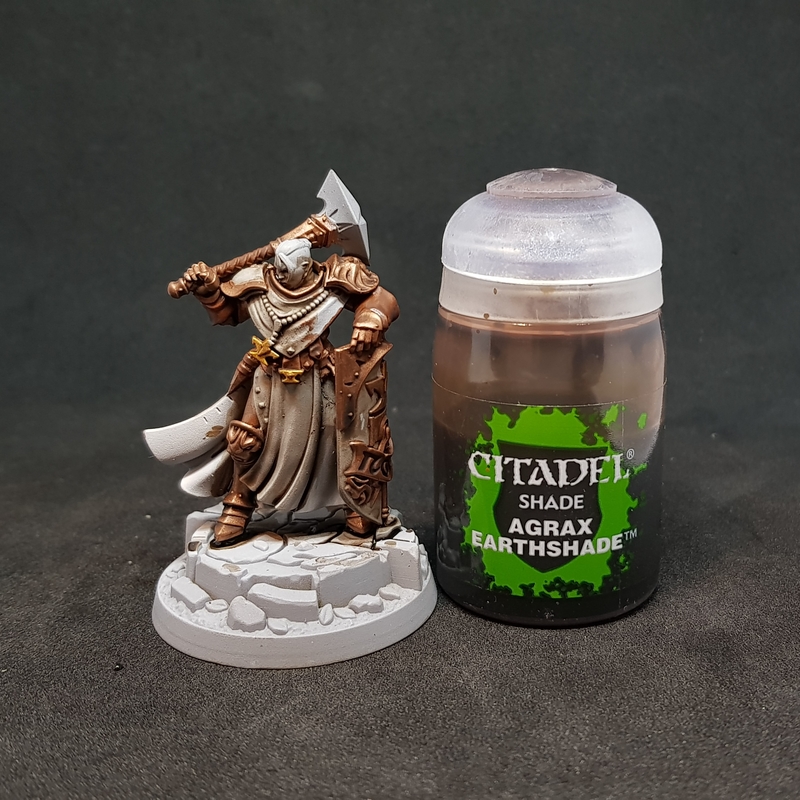 Next they had an all over wash of agrax earthshade. Then they were highlighted, almost exclusively with drybrushing. Then I worked in patches of Typhus Corrosion. 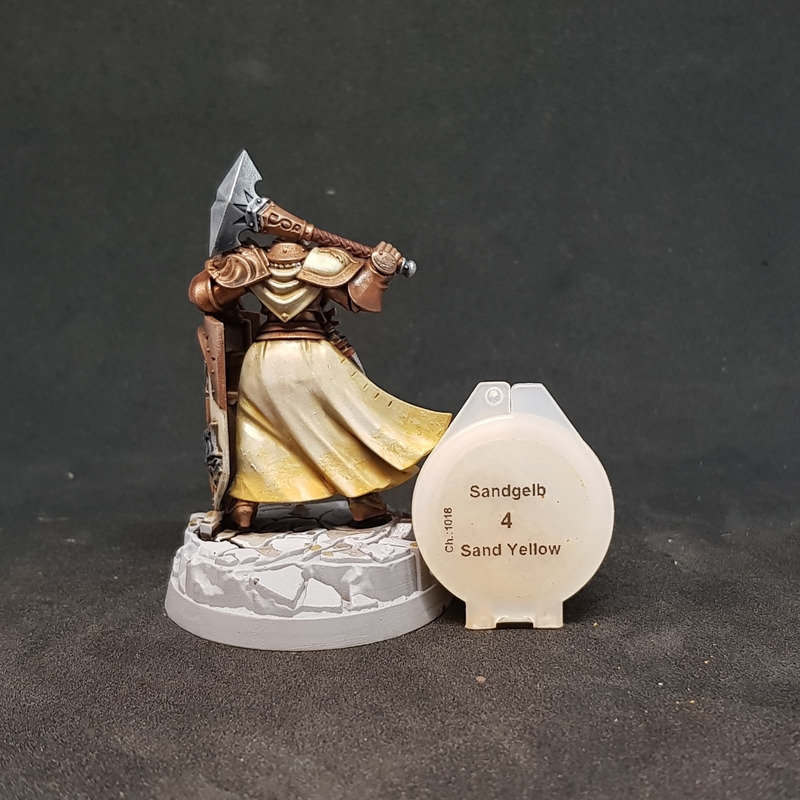 Then patches of the sand yellow weathering powder I used on the cloaks. Finally the scatter was added. 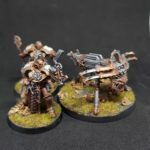 Scorched grass, and old GW flock. And birch seeds for the leaves. The base was given a black rim and then it was completed. Here are the full units. I hope you find this useful, any questions, just ask! This is ace! 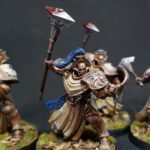 Wish I had painted my Stormcast after reading it as you have me inspired to make them better. Awesome guide. Very well laid out (especially showing the paints used per stage) and explained. I love how you’ve shared your lessons learned over the project. Perfect job mate and an awesome result!